By assembling the many parts of this puzzle from old recipe books, advertisements, letters, diaries, genealogical records, and other primary sources, researcher and writer Becky Diamond has been able to provide a more complete portrait of this influential figure in cooking history.Mrs. 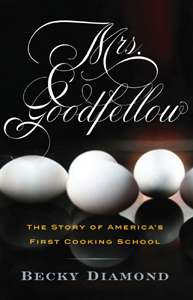 Goodfellow: The Story of America’s First Cooking School begins with what we know about Elizabeth Goodfellow—where she was born, her husbands, her children, where her shop was located. We then travel back in time to discover the kinds of foods that would have been available to Goodfellow and how she may have used them. The book next turns to the rise of both commercial eating establishements and books of recipes. From here, the author explains the rapid expansion of cooking schools, such as the New York Cooking Academy and the Boston Cooking School, made famous through its association with Fannie Farmer, and ends with a discussion of the role of celebrity chefs. Thoroughly researched and including a range of authentic recipes, Mrs. Goodfellow is a delicious exploration of the life and legacy of one of America’s most influential cooks. Beautifully written post by Daniela L. Geremia Tenuta ~ My little old world ~ gardening, home, poetry and everything romantic that makes us dream. As home cooks around the region are heating up their kitchens for Thanksgiving, many will wish they had taken a class to learn how to make a meal that inspires thanks. And what few know is that Philadelphia was home to the first cooking school in the country. Young women came to learn from the Martha Stewart of the 1800's - Mrs.Elizabeth Goodfellow. Becky Diamond of Yardley, Bucks County, wrote the biography, "Mrs.Goodfellow: The Story of America's First Cooking School" and she says in today's world of food obsession heralding fresh, local ingredients, that's not such a new trend. Mrs.Goodfellow was doing it two hundred years ago. Welcome to Philadelphia, a city renowned for its vibrant, seasonally centric dining scene and colorful farmer's markets. 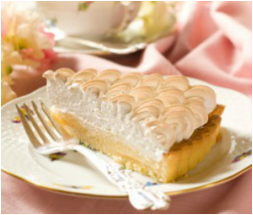 You'll find some of the finest dishes on any table here, and confections that rival those served in the patisseries of Paris. Here, too, there is a culinary school geared to producing top-quality cooks as well versed in pastry as they are in producing savory delights.